We had a terrific time at BarkWorld Expo last weekend. And one of the highlights was a keynote speech by Victoria Stilwell. Here's an excerpt from her speech where she talks about positive dog training methods and her network of like-minded positive reinforcement dog trainers. We love Victoria's training methods and she is a lovely person too. After her speech at BarkWorld she stayed to chat, sign autographs and take photos with every BarkWorld attendee. Victoria visits with flat pets -- Tyler, Preston and Cosmo -- while the stage is being prepared for her talk. Preston, Cosmo and Tyler had their own chance to speak too -- their humoms were part of a panel discussion about bloggers and brands immediately before Victoria's speech. For more photos from our wonderfur BarkWorld adventure check out To Dog With Love's Facebook page! 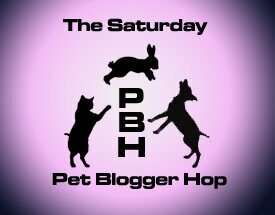 Now let's go to the Saturday Pet Bloggers Hop! I really like Victoria. She really understands us dogs.Thanks for posting that video Cosmo! ƴߋu juѕt shared this uѕeful іnformation with us. Please keepp us սp to dqte likе tҺis.